One question I've fielded on more than one occasion concerns which program to use for audio recording on Palm OS devices without a standard voice memo app. With the arrival of the excellent TaleStuff add-on microphones for the Palm TX and T5 handhelds, I had to find a capable audio recording application to use on Palm handhelds never intended by Palm to be used for audio capture. Enter Personal Audio Recorder Pro! While I used the surprisingly capable freeware app, SoundRec, for my initial TX microphone module tests, I immediately began looking for a more powerful commercial audio recording application. After realizing what high quality sounds could be captures to a Palm device with a quality external microphone and an amply sized SD card, I wanted to find an application that permitted more than just changing sampling rates. I vividly remember playing around in Windows 3.1 with a Radio Shack mic and my first ISA soundcard in the early 90s, trying to figure out if lower frequency 16-bit sounds turned out better than high-frequency 8-bit sounds and how much waveform audio I could fit onto a 1.44mb floppy disk (it wasn't much). Per the advice of TCL guru Gary Mayhak, I sought out ToySoft's Personal Audio Recorder Pro program. I installed the full version of the latest 3.3 version of app on my Palm TX and gave it a trial run with a Tech Center Labs add-on bud microphone (see the review here). I tested the program on my Palm TX with a high-speed Sandisk Ultra II SD card and a Tech Center Labs bud microphone. I also tested it on my Treo 700p with a Patriot 133x 4gb SD card. For the vast majority of my “field” recordings I stuck with the program’s recommended settings of 16 kHz, 16-bit, uncompressed mono audio. Even on an overclocked TX with a fast Ultra II SD card, there was considerable audio stuttering at the very highest sound quality settings. I spent on weekend afternoon messing around the house and in the backyard capturing a variety of “found” sounds. I noticed no performance differences between the TX and the 700p. I also did not have any issues relating to SD card speed, even when I used an old, slow 32mb SD card I found in my desk drawer. In informal listening tests, the combination of PAR Pro and the TCL microphone on my TX produced much better quality recordings than the 700p’s internal mic and the Palm voice recorder app. While testing SoundRec alongside PAR Pro on the TX produced similar recording quality, PAR Pro still sounded a bit crisper even when the same microphone was used. PAR Pro has a very useful onscreen menu option to toggle between a Palm device’s main memory, a built-in memory drive (like the T5 or LifeDrive) or an external storage card. PAR Pro refreshingly supports renaming and deletion of existing wav files from within the app itself in addition to offloading files stored in main memory onto an SD card. This single features seals the deal in convincing me to upgrade from the standard Palm voice recording app on my Treo. I actually had to e-mail myself a number of voice memos from my 700p due to the Palm VR app lacking any sort of external memory card functionality. 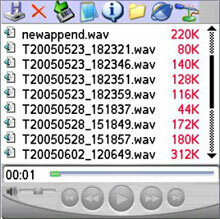 Personal Audio Recorder Pro occupies ~307kb of device memory. It can be launched from main memory or an expansion card with no ill effects. Toysoft advises that the PAR Pro runs on the Treo 600/650/680/700p, all Tungsten models, and the Zire 71/72 in addition to the LifeDrive. Recent conversations with Toysoft have also confirmed full Treo 755p compatibility. Personal Audio Recorder Pro is simply a well-rounded and very capable portable audio recording solution, nothing more and nothing less. It thankfully doesn’t attempt to be a jack-of-all-trades multimedia app playing every conceivable A/V format under the sun. I would like to eventually see the program updated to add additional features such as 320x480 screen support and some kind of auto-update checker to utilize the online capabilities of Treos. While casual users will likely be content with one of the many freeware programs available online, PAR Pro will nicely suit to the enthusiast who wants a high-quality sound recording application for serious professional or hobbyist use. Personal Audio Recorder Pro for Palm OS is available now for $24.95. A trial version is available for download. What's the highest sampling rate you believe that a treo 650 could handle? Did you try any above 16kHz? Is it the ability to write to the SD card? Seeing as SoundRec can have up to 24kHz does that mean PAR pro doesn't actually give higher quality sound at the recommended setting of 16?